An email blast will be sent out to all UNI families with this Trojan Tuesday update. So what exactly is Trojan Tuesday? It is a weekly update on how our varsity athletic teams are doing and provides updates on what is happening on the UNI campus the upcoming week. Trojan Tuesday will still be published on the original website for anyone who does not receive the UNI email blasts. If you have family members who are interested in reading Trojan Tuesday each week you can send them to https://unitrojanthursday.wordpress.com. They will enter their email address on the right side of the page and they will receive a notification every time there is a new post. If you are not interested in reading about our athletic teams and what is happening on campus then you can simply delete this email each week. I was not able to publish Trojan Thursday last week as Mark Cunningham and myself were in San Diego at the California Athletic Directors Conference. Due to the fact that there were no updates last week, I will include the past two weeks in today’s update. Trojan Tuesday is not normally this long J. While in San Diego we won a $1,700 fan for our new weight room. They must have known that a fan was on our wish list for our new weight room. The kids love this new fan and it has helped to cool the room a bit. We are looking to purchase one additional fan as we could then keep one by each door and blow some air around in the room. 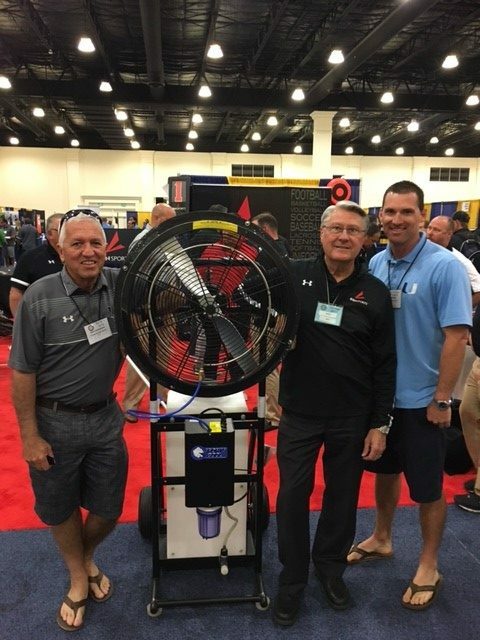 Below is a picture of us with the BSN sports rep who donated the fan. A big thanks to BSN for putting this up as a giveaway. We sure were lucky to win it. Baseball – On Friday the 8th our boys beat Northwood by a final of 6-3. Jacob Collins threw a 2 hitter on the mound for us. Our boys stayed hot by defeating Irvine by a final of 5-1 on the 12th. Neil Boudreau also threw a two hitter on the mound and he was 3-4 at the plate. Great game Neil. Irvine came back to beat us on Friday 15th. Last week our boys ran into a hot Woodbridge team who swept both games. On Tuesday we fell by a final of 10-1 and Friday was a 6-0 final. Our boys will welcome league leading Beckman to our stadium this afternoon for a 3:30 start. Good Luck baseball. Boys Golf – Our boys beat Northwood on the 14th by a final of 172-177 Koichiro Sato and William Tse shot 34. Lost to Woodbridge on Tuesday the 12th by a final of 183-189. Our boys bounced back to beat Mission Viejo 186-196, William Tse shot a 34 to pace the Trojans. Last week was a rough one for the boy’s golf team. It started with a close match against Northwood. They beat us with a team score of one under par while we totaled a two over par score (179-182). Not too many teams in the county are shooting such low scores! Low golfers for Uni in that match were Koichiro Sato, 35, and William Tse, 34. We beat Mission Viejo at their course on Wednesday. Griffin Pace led our team with a 38. In the third match of the week, we traveled to Newport Beach CC to play CdM. We lost that match 190-200. Sato delivered a 35 for the Trojans. We are currently in 4th place in our league. Boys Lacrosse – University Boy’s lacrosse played a great game versus Woodbridge HS on Monday the 11th. It was a great game to watch. Both teams had many opportunities and each capitalized when they could. It was 5-3 at the end of the first half, Uni came out of halftime energized. Uni tied the game up at 5-5 with great goals from Nick Khamseh and Isaiah Muniz. It was back and forth with both teams exchanging goals. Woodbridge would seem to have the answer every time, when Uni would get close to scoring. It came down to the last minutes with Uni losing 8-7. Our boys played Northwood, Sage Hill and Irvine HS the past week. Last Monday they played at Northwood with pride and spirit. Uni came out firing and #2 PCL team, NHS, found themselves down 1-3 at the end of the first quarter. The game was close until the final minutes, when Northwood got in a rhythm winning 12-5. Wednesday’s game was a great opportunity to right a wrong versus Sage Hill. Uni had played poorly the first time these teams met, so the kids were looking forward to the rematch. The Uni team played one of their best games of the season with everyone working hard every possession. University dominated Sage Hill winning 13-4. Yesterday, Uni travelled up Culver to play IHS in a night game. University had lost 9-5 the first time these two met. It was a defensive game with the teams tied 2-2 at halftime. Uni went up 6-3 and was in control, but then had a few mental lapses and found the game tied going into the last minutes. The kids played so much better and had improved so much over the course of the season, but it wasn’t enough losing 7-6. Our boys will battle Woodbridge on Thursday at 4:00 here at UNI. Good Luck boys. Girls Lacrosse – The Girls Lacrosse team played a fantastic league match against Woodbridge, earning a first-ever victory over the Warriors, 10-9 in overtime. The Lady Trojans tied the score 9-9 with 31 seconds remaining. After conceding possession off the draw, the stout defensive play of the team forced a turnover and two passes put Senior Kathy Guo into scoring position. She scored the game winning goal 34 seconds into the overtime period. With the win, the team jumped to third place in league play. A loss to league opponent Beckman followed on Thursday and the team is in action again for their season GOW against Irvine on Monday, 4/18. The team would love to see you and hear you out there in the stadium cheering them on! Come out and support! The Girls Lacrosse team had another up and down week last week. The team cruised to a solid win over Northwood last Monday, with a score of 17-6. Jr. Ashlyn Wang led the scoring with 5 goals, Sr. Sarah Verdegan added 4. Jr. Amanda Shubin (3), Sr. Jenny Bardwell (2), Jr. Anneke Gustafson (1) and Sr. Kathy Guo (1) rounded out the scoring. Additionally, Sr. goalie Lily Huang made 9 fantastic saves to keep Northwood out of the match. That excitement was followed by a loss to league leaders Corona del Mar, 6-14. 6 different players found the back of the net for Uni, highlighting the depth of the attack on the team. 5 different players also made fantastic interceptions and, despite the score line, the game was not as uneven as it seemed. The girls played with intensity and passion and the game was very exciting to watch. Last night, cheered on by ASB and other supporters for the Game of the Week, the team bested Irvine 16-5. Jr. Ashlyn Wang added 5 more goals to her season total, and again 6 other players added to the offense. In one memorable play, Sr. Courtney Le stepped up to play on the circle, snagged the ball out of the air off the draw, and sprinted down the field to score a beautiful goal. Le also forced 2 turnovers, and gained possession with 3 groundballs and 2 interceptions. The team is back in action this Thursday for the last league match against Woodbridge. The team will need all the support they can get, as they bested Woodbridge by one goal in the first meeting. With a league record of 5-4 right now, a win would be huge, so come out and cheer on the team! Great job LAX! Softball – Last Tuesday, the UNI softball girls had a huge team win over Corona Del Mar at their GOW ending with a final score of 24-5. Junior Aubrey Maher was a powerhouse at the plate, going 4-4 with three doubles plus a walk. Janette Oh went 2-3 with a triple and a double plus 2 walks and Michela Boarnet also went 2-3 with a 2-run RBI triple and sophomore Peyton Mattson went 2-3 with 2 singles. Defensively, Janette Oh and Alexis Arredondo gave their all in the circle and were backed defensively by the rest of the team. The lady Trojans faced Irvine on Thursday and suffered a devastating 9-2 defeat. Janette went 2-3 with a double and 2 stolen bases to set up Monet Allister for a RBI. Freshman Kami Parsa went down the right field sending Zoe Manjarrez home for the RBI. The Uni Softball team, undefeated at home, is looking to continue to “defend the den” in two home games against Woodbridge and Beckman this week. Good Luck this week softball! Boys Swim – Two weeks ago our boys beat #5 ranked CDM 89 – 81. Highlights of the meet included incredible relay anchor swims by Andrew Knoell, a great 100 Fly 1st place finish and CIF qualification by freshman Aaron Lee, and a 1-2-3 finish in the 100 Backstroke by Andrew Knoell, Sean Messer, and Austin Yan. 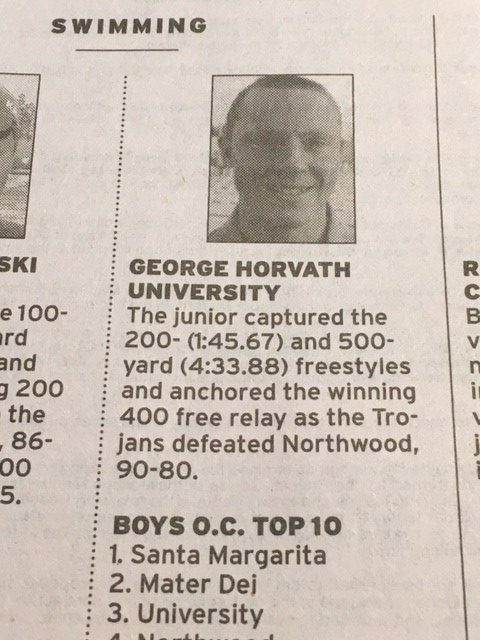 Congratulations to Greg Horvath for being selected as the OC Register Swimmer of the week two weeks ago. Below is a picture that was posted in the paper. Girls Swim – The Uni girls swim team has had several important meets since the last update. In their third league meet they defeated CDM, the Varsity Girls by a score of 90-80, making them 3-0 in league and guaranteeing them an improved league record over last year. In the CDM meet, Freshman Riley Lexvold was a double individual winner in the 200 IM and the 100 back as well as being a member of both the winning 200 medley and 200 free relays. Senior Princess Ferguson-Nguyen was also a member of those two winning relays and an individual winner in the 100 free with a new CIF consideration time of 54.58. She also swam a season best time in the 50 free of 24.99, also a CIF consideration time. Uni swimmers Lexvold, junior Anne Jang and sophomore Alondra Ortiz swept the 100 backstroke. Sophomore Bella Khamseh lowered her CIF consideration time in the 100 breaststroke and the 400 free relay team of Jang, her sister sophomore Claire Jang, Khamseh and senior Celine Nie lowered the team’s previous best CIF consideration time by 4 seconds to seal the victory. The girls competed well but fell in their next meet to the defending league champions, Irvine HS. Notable swims from that meet included the 200 medley relay team of Ortiz, Lexvold, Jang and Ferguson-Nguyen lowering their CIF consideration time, Lexvold hitting a CIF consideration time in the 50 free with her leadoff leg in the 200 free relay, Ferguson-Nguyen lowering CIF consideration time to 54.48 in the 100 free, Lexvold far outdistancing her competition in the 500 free to win by almost 30 seconds, with a CIF consideration time of 5:08.28, and Ortiz lowering her consideration time while winning the 100 back. The Varsity girls also participated in the annual Foothill Swim Games, an invitational meet attracting many of the fastest teams in all divisions in Orange County. This was a two day, prelims and finals meet. Uni girls finished 7th out of 13 teams and only 1.5 points behind Northwood in 6th place. There were many outstanding performances at this meet. Freshman standout Riley Lexvold won the 200 IM in a CIF automatic time of 2:02.69, 2 full seconds ahead of her closest competition and more than 3 seconds faster than her prelims time. She also finished third in a very fast field of the premier female backstrokers in the county lowering her CIF automatic time to 55.18. Junior Anne Jang finished 7th and sophomore Alondra Ortiz finished 8th in that heat, both with season best CIF consideration times. Ortiz and Jang also had season best CIF consideration times in the 100 fly, finishing 9th and 11th and only .04 seconds apart. Sophomore Bella Khamseh finished 7th in the 100 breaststroke, lowering her CIF consideration time in prelims to 1:09.33. Alison Huxman, Madi Wakita and Angela Yang all had huge time drops in the 500 free in the preliminary swims. And finally, both the 200 medley relay team of Lexvold, Khamseh,Ortiz and Ferguson-Nguyen, and the 200 free relay of sophomore Claire Jang, Lexvold, A.Jang, and Ferguson-Nguyen finished with CIF automatic qualifying times. Tomorrow will be the last dual meet of the season, the GOW, against Woodbridge HS. Please come out and support the swimmers! Tennis – The boys varsity tennis team moved to 11-1 overall and 4 and 0 in league play with two big wins two weeks ago. The #1 ranked Trojans defeated Woodbridge 10 to 8 on the 12th. Uni won all 9 doubles points and sophomore Leo Krapp won the match with a victory at third singles. On Wednesday the 13th our boys defeated the #2 ranked team in the county, CdM, 11 to 7. Julian Lafond, Naevin Anukornchaikul and Garrett Kurtz all got a win playing singles. Captain Josh Piatos and junior Hans Hwang swept all three of their sets to go undefeated on the day. Patryk Kozlowski and Hudson Graf also won all three of their sets as well. Our UNI boys tennis team spent last weekend in Ojai taking part in the Ojai tennis tournament. Josh Piatos, JT Joens and Tommy Wang represented the Trojans well in this tournament. The boys have a busy week beginning with a difficult match at CDM this afternoon. Currently the Trojans are the top ranked team in Orange County while CDM is ranked 2nd. On Wednesday the boys will travel to Northwood to take on the Timberwolves and then finish the week with a match against Irvine at Uni on Thursday. The team is currently 13 and 1 overall and 6 and 0 in Pacific Coast League play. Good Luck this week Tennis. 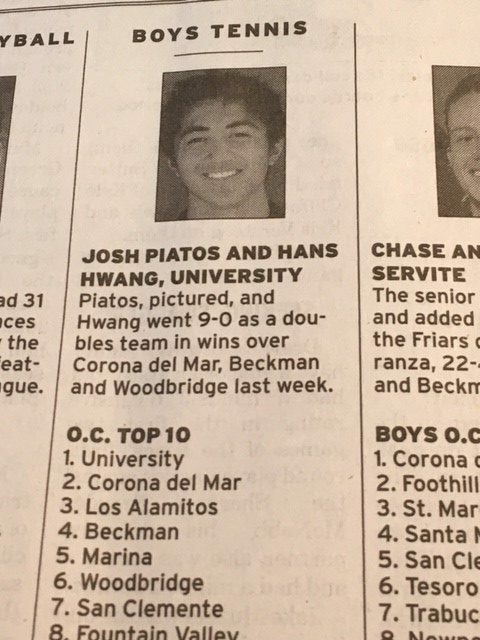 Last week Josh Piatos and Hans Hwang were named the OC Register Tennis athletes of the week. Below is a picture that was published in the paper. Great work boys. Boys and Girls Track – On the 14th our Boys and Girls Track and Field team competed against Northwood. Some outstanding performances from the girls came from Paige Metayer, Melissa Lee, Leyna Wood, Lauryn Wood, Daria Skhel, Jamie Hocker, Sophie Lawrence, Andrea White and Sonia Lin. On the boys side, we had some outstanding performances from Eric Kawana, Lee McElliot, Kevin Yamapath, Harry Baker, Danny Gilbertson, Elias Canneson and Micheal Jung. Please congratulate our two female athletes (Melissa Lee and Paige Metayer) in being accepted to the Arcadia Track and Field Invitational. This is the 2nd largest high school track meet behind the Olympic trials. 700 schools applied for an entry and only 570 schools were accepted from around the US. Melissa was accepted for the discus event and she was very excited to be there. Unfortunately at the time of her event, there was a massive down pour over ½” in less than an hour which made it difficult to compete for all of the lady throwers. Paige’s event took place a half hour earlier with the most optimal conditions. From lane 8, Paige finished 3rd in her heat beating her own school record with a time of 56.61. Paige finished 7th overall for the day events and 21st overall including the night events. Also thanks to her teammates Lauryn and Leyna Wood for coming out to support their team mate. 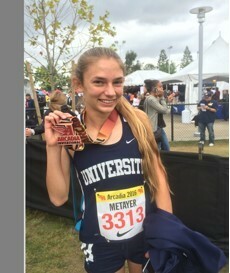 Below are two pictures of our athletes at the Arcadia Invitational. This last weekend, Track and Field competed in the OC Track and Field Championships at Mission Viejo High School. Melissa Lee ended up 7th in the county and a personal best mark of 123’ 7”. Lauryn Wood, Leyna Wood, Setarah Emadi and Daria Shkel represented our girls F/S in the 4 x100 relay and were the top team in the county.CC Langlois was 9th in the county for F/S 1600. Faris Qaisi finished 7th in the county for F/S 200 and Harry Baker finshed 9th in the county for the Varsity 100. This week we conclude our league meets with Woodbridge here at home. Go Trojan Track and Field! Volleyball – Our volleyball team will play in their GOW this Friday at 5:15. We hope you can come out and support our boys in their final home game of the season. Good Luck boys. Triple GOW This Week – Our girls Lacrosse team started things off last night with a big win v Irvine. Our swimmers will have their GOW on Wednesday v Woodbridge and Volleyball will close out the week with their GOW on Friday v Irvine. We hope you can make it out to support our teams in their big games. Baseball – The varsity Baseball team went 2-2 in the Ryan Lemmon Tourney during the Easter break. Jacob Collins threw a 1 hitter in the team’s 2-0 victory over Laguna Beach and we also defeated San Pedro 6-5 with Kahi Rodrigues throwing out the winning run at second base to win the game. Andrew Nelson, Alex Roude, Drew Nelson and Iahsiah Francis did not allow a run during the tourney on the mound. Neil Boudreau was voted all tourney after collecting 9 hits during the week. Great job Baseball! Boys Golf – Our boys golf team has not had a match since spring break. They have been practicing hard both on the range and course to get ready for their match today at Oak Creek Golf Club v Northwood. Hit it straight today golfers. Boys Lacrosse – The University boy’s lacrosse team played two games this week. The Sage Hill game was a back and forth contest, with UNI leading, then Sage, then UNI, until the game ended with Sage Hill defeating Uni 10-8. The second game was against the very talented Northwood team. UNI played with spirit and improving team play. In both games, UNI had a lot of shots on goal, which is awesome, but not many found the net. The team continues to improve in all categories. Great job boys. Girls Lacrosse – Congratulations to the team for being ranked in the top 20 teams in all of Orange County. This is a first for the program! In league play, Girls Lacrosse had a turbulent week, to say the least. The week began with a tough loss to league leaders Corona del Mar, 14-4. Midfielder Ashlyn Wang led the Trojan offense, scoring 3 of the 4 goals. Senior goalie, Lily Huang, made 8 amazing saves to help the team. Despite the low score for the team, they forced CdM’s goalies to make 13 saves, showing that they were producing offense. This match was followed by a solid victory over Northwood on Wednesday, 15-5. Ashlyn Wang added 5 goals to her season total, and Sarah Verdegan and Amanda Shubin contributed 3 each. The ladies displayed their skill all over the field, forcing turnovers in the defensive third, the offensive third, and the midfield. Despite being frequently tested, again goalie Lily Huang made 8 strong saves to help keep Northwood out of the match. The team plays again tomorrow in a non-league match against Rosary, and then resumes league play on Monday with a home match against Northwood. Please come out and support what will be a momentous match! Softball – Thursday before break, the UNI Softball girls triumphed over Estancia with a huge comeback win 13-10. After being down 10-2 going into the 4th inning, the girls fired back with four runs in the 4th and seven runs in the 6th. Janette Oh went 2-3 with a bases clearing triple, four SB’s and a walk. Anna Hawkins walked three times and scored 2 runs and Monet Allister hit an RBI double and scored two runs. Over the break, the girls faced some tough teams in the Woodbridge tournament – Mater Dei, Garden Grove, Lakeside, Burbank and La Serna and then returned this past Tuesday with another huge comeback win over Costa Mesa. Pitchers Janette Oh and Alexis Arredondo combined for the win. The Trojans gave up runs early to go down 12-5, but stormed back scoring 14 runs in the 4th, 5th and 6th innings. Freshmen Monet Allister ripped her first career Homerun over the left field fence, Freshmen Alexis Arredondo went 4-4 and the whole lineup got on base in the 6th inning! The Lady Trojans open up league Tuesday April 12th at Beckman! Good Luck Softball! Boys Swim – UNI’s boys swim team had a great week! On Tuesday, we went up against our top league opponent, Northwood, and came away victorious 90-80. Though we were missing a couple key guys, the rest of the team stepped up. George Horvath had a particularly good meet, placing first in both of his individual events, and making CIF times in both. Jarod Yoshihara picked up a pair of crucial 2nd place finishes. Our 400 free relay team composed of Stephen Yang, Sean Messer, Jarod Yoshihara, and George Horvath sealed the meet by out-touching Northwood’s top squad. Girls Swim – After a week off from competition (but not from training!) during Spring Break, the Uni girls swim team was back in action this past Tuesday, defeating cross town rivals, Northwood HS, 90-80, for their second league meet victory in a row. The girls won both the 200 medley relay and the 200 freestyle relay, dropping their previous CIF consideration qualifying times by 2 seconds in the medley relay and also in the 400 freestyle relay. Freshman Riley Lexvold was an individual double winner again, winning the 200 Individual Medley and the 100 backstroke as well as swimming in both 1st place relays. Junior Anne Jang had significant time drops in the 100 fly and 100 backstroke, coming in 2nd in both events with new CIF consideration times. The trio of senior Princess Ferguson-Nguyen, sophomore Bella Khamseh and senior Celine Nie went 1, 2, 3 to sweep the 50 freestyle. Khamseh also finished second in the 100 breaststroke with her first individual CIF consideration time. The team will be in action again next Wednesday in a home meet against always strong CDM. Come out and support the team! Below is an article that was printed in the OC register on this big swim meet. 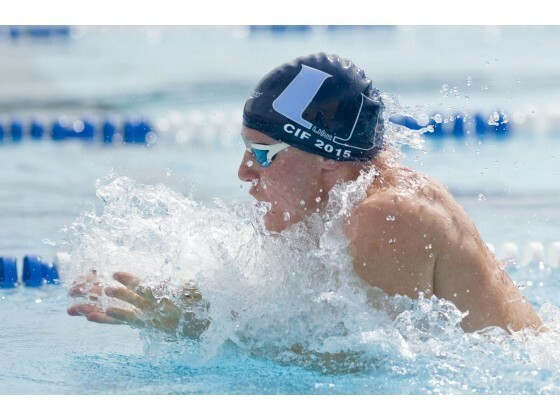 IRVINE Don’t count out University’s boys swimming team just yet. Or the Trojans’ girls team. The two-time defending CIF-SS Division 1 boys champion bounced back from some early-season jolts to post a short-handed victory, 90-80, at No. 4 Northwood in a Pacific Coast League meet Tuesday. University’s girls improved to 2-0 in the Division 1 league with a 90-80 triumph behind several season-best times. The Trojans were 2-3 in league last season. The Trojans’ boys, ranked third in the county, absorbed a runner-up finish to Loyola of Los Angeles at the Millikan CIF Southern Section Relays last month and then dropped a dual meet at Santa Margarita. But they captured a tight meet at Northwood despite racing without one of its speedsters, Andrew Knoell. “We’re still strong. We’re still coming and we’re still going to be highly competitive,” University first-year coach Ryan Vande Wydeven said. The University and Northwood boys were tied, 46-46, going into the 500-yard freestyle, but the Trojans took the lead for good behind a victory by George Horvath. The junior finished in an automatic Division 1 qualifying time of 4 minutes, 33.88, not far off his lifetime-best time. The Trojans also received a pair of strong runner-up finishes fromJarod Yoshihara. The senior touched second to Horvath (1:45.67) in the 200 free (1:47.14) and second to teammate Sean Messer(54.50) in the 100 back (55.15). Yoshihara also anchored the 200 free relay to a critical victory in 1:31.30. University’s depth showed with second-third-fourth finishes in the 50 free and 100 butterfly to steal the events, 9-7. In the butterfly,Aaron Lee (53.79), Stephen Yang (54.58) and Alex Hao (54.94) touched within about a second of each other behind winner Hwa Min Sim of Northwood (52.74). Northwood was without Hunter Hitchens (eligible April 20) and Shawn Lou (back), but Cameron Hsieh swept the 50 (22.55) and 100 (48.45) freestyles. University’s girls posted season-best times in all three relays, sent freshman Riley Lexvold to two victories in the 200 IM (2:07.83) and back (58.27) and received swift runner-up finishes from Anne Jang in the 100 butterfly (1:00.77) and backstroke (1:00.95). “We definitely are showing a lot of signs of progress,” University girls coach Lara Navarro said. Northwood also had reasons to be encouraged. Gabe Munoz and Hsieh’s sister, Amanda, also were double winners. University’s George Horvath swims the breaststroke leg of the 200-yard medley relay during Tuesday’s meet against Northwood. For more pictures from this meet please check out the link below. Tennis –Our boys went 2-2 in the All American tournament before spring break. This tournament is made up of the best teams throughout the nation. On Tuesday our boys cruised to a 17-1 victory over Irvine to bump our league record to 3-0. Our boys will travel to Northwood this afternoon for a 3:00 match. Good Luck tennis. Boys and Girls Track – Boys and Girls Track competed against Beckman for our league opener. On the Girls side we had outstanding performances from the following. Ceci Langlois in the 1600, Sara Sussman and Janine Bryant in the 800, Sonia Lin and Grace Finn in the long Jump, Sonia Lin in the in the 100Hurdles, Sophie Lawernce in the 300 Hurdles, Daria Shkel in the High Jump, Paige Metayer and Sara Sussman in the 400, Setareh Emadi in the 200, Daria Shkel in the Triple Jump, Leyna Wood and Daria Shkel in the 100, Andrea White in the 3200, Melissa Lee in the shot and discus and we won the 4 x 100. The most notable performance for the girls came from Paige Metayer in her school record setting 400. Paige ran 57.14 sec which broke the old school record from 1980 that was held by Keyana Thornburg. On the boys side, they won a nail biter by one point. The boys began the meet with a win in the 4 x100 followed by excellence performances from Eric Kawana and Nathan Gali in the 1600, Brett miller and Lee McElliot in the 800, Darius Outland and Kevin Yamapath in the High Jump, Morias Burge in the 110 Hurdles, Alex Madrid and Danny Gilbertson in the 300 Hurdles, Brett Miller and Luke Ruan in the 400, Harry Baker and Jeremy Koo in the 200, Kevin Yamapath in the Triple Jump, Harry Baker, Jeremy Koo and Darius Outland in the 100, Eric Kawana and Mackhai Nguyen in the 3200, Micheal Jung, Janary Ayaso and Austin Kim in the Shot Put. Tomorrow we will compete here against Northwood. Saturday we will have Melissa Lee and Paige Metayer competing in the Arcadia Invitational which is the 2nd largest Track and Field Invitational for a high school athlete behind the Olympic trials. 570 schools from around the nation will be represented at this meet. We wish them the best. Go Trojan Track and Field! Volleyball – Our Boys Varsity beat Northwood in 3 games Tuesday! Special mention to Dylan Sun for his work on and off the court as a setter, he is growing into a technically sound and smart player. Our boys are back on the court next Tuesday at Irvine. Good Luck Volleyball. New Weight Room at UNI? The athletic department and Physical Education department are working hard to raise funds to make much needed upgrades to our UNI weight room. Almost every UNI student will work out in the UNI weight room in their time here. The weight room is used every period with the PE classes and is used by our athletic teams before school and in the afternoon. Our goal is to make the weight room safer by bringing in new equipment and getting rid of or fixing broken equipment. We began this process a few weeks ago and the students love what we have done so far. We repainted the room to our UNI colors three weeks ago. Our benches were falling apart and we had every bench re upholstered and replaced missing parts to our equipment. We placed a custom U logo on all of our benches to promote a pride in our weight room. We replaced broken or stolen weights to make sure we have complete sets of dumbbells and kettlebells. We purchased all new bumper plates. We also purchased class sets of medicine balls for our students to use. We see the response from our students and we would like to continue with the upgrades to the weight room. Once again the major obstacle holding us back is money. We would like to raise enough money to purchase the following. Industrial fans to help cool the room – There is no air conditioning in the room and it get extremely hot in there. Computer with a TV monitor to post workouts and show videos on how to properly execute lifts or workouts. We had originally wanted to make these upgrades over the next few years but it really is time to make this room amazing for our UNI students. All of our current equipment was purchased in 1992. Our bars and weights have been dropped for 24 years now and they are almost all destroyed. We are asking the UNI community for help in raising funds for this project. We are trying to raise $9,000. This would give us enough money to purchase the racks and other equipment that we have on our wish list. We want this to be a first class facility. Between the athletic department and PE department we have already poured $30,000 into this upgrade. We are so close to finishing these needed upgrades but we are out of funds. If you are interested in making a donation towards this project please drop off a check to the athletic office. All checks should be made out to UHS Athletics. All donations are tax deductible. A little information on the weight room and how much use it gets. The following athletic programs have used the weight room or equipment from the weight room with their program this year. Baseball, Football, Boys Water Polo, Girls Water Polo, Girls Swim, Boys Swim, Cheerleading, Boys Volleyball, Girls Volleyball, Boys Tennis, Girls Tennis, Boys Basketball, Girls basketball, and Wrestling. The room remodeled in 1992. There have been no major updates to the room and equipment since then. How many students can be in the room at one time? The football team is the largest group that uses the weight room. They have about 80 athletes in there at one time. In purchasing new racks that will open up the weight room and allow more students to safely use the room. The new racks will allow students to squat and bench press in the same area. Our old set up had squat racks on one side of the room and bench press on the other side. We will save a lot of room with these new racks. Number of student athletes who use the room per day? There are about 55 students each period in our PE classes who use the weight room. That is 275 PE students per day. Before school and in the afternoon our athletic teams use the weight room. Swim and water polo use the room in the morning. Between the boys and girls program they have about 75 students who use it. In the afternoon several teams use the facility. There are several time slots to get our teams access to the room. Each team brings in 30-90 athletes depending on the teams size. On any given day there are about 500 UNI students who use the room. Thanks for your help with this project and as always GO TROJANS!